When moving there are a lot of moving parts, sometimes making it hard to keep everything organized. Implementing a moving checklist is a good way to ensure that nothing gets overlooked. But, how else can you stay organized and maintain your sanity during the chaos that inherently is a move? Below we’ll discuss 5 different tips to help you stay organized and in control during your move. Once you have established what needs to be done, and how you are going to tackle the assigned tasks, it is best to get right to it. Knowing what needs to be done allows you to work on tasks when you have a few extra minutes here and there throughout your day. If you find that you have time to debate about whether or not to pack at a given time, you have the time to do it. Don’t waste that time. 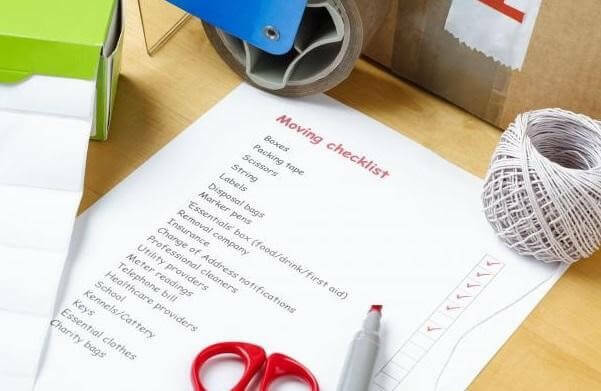 Packing is the most time-consuming aspect of moving so don’t drag it out longer than necessary. Before you begin packing, establishing a staging area for organization and sorting will prove to be invaluable as you get in the thick of things. This method allows for you to pack up one room at a time, without turning your entire home upside down, and into a sea of packing tape, bubble wrap, and boxes, with and without labels. A staging area is also a great space to keep extra boxes and packing essentials, along with your essentials box and items that you want to wait to pack till the very end. You’ve probably heard this piece of advice a dozen times before, go through everything you own and get rid of anything that is broken, you don’t need, don’t want, or don’t use anymore. Use this time of moving to a new place as an opportunity to start fresh, and only take the essentials with you. Remember, a successful move not only includes safely moving everything from your current home to your new home, it also includes knowing when to leave some things behind. One way to help with unpacking is to pack all of the items stored together in the same boxes. Instead of emptying out your dresser drawers into boxes, pull them out and use shrink wrap to keep everything in its place. This same concept can be applied to your kitchen flatware/cutlery tray! Try to keep similar items together to make unpacking an easier, less stressful process. No one remembers every little thing that they are supposed to do. That is why it is important to write everything down and utilize a moving checklist to stay organized. It is one thing to get everything you own into boxes, but it does you no good if boxes aren’t clearly labeled. Establishing a system (colored dots for each room, numbering system, etc.) that makes sense to you can save you a lot of time when trying to get unpacked and settled into your new home. You’ll know right where to drop off each box as it comes off the truck without having to move it from room to room before it finds its right home. Do you know what to do with your used moving boxes?